> Blog > Between Festivals > Heading to OH-fest! Tomorrow June and I will be in Oneonta to man our Glimmerglass Opera booth at OH-fest. OH-fest is a free popular street festival presented by the city’s two colleges, SUNY Oneonta and Hartwick College. We have participated for several years and each spring we look forward to interacting with the community. This year we are celebrating our upcoming production of The Marriage of Figaro with a giant picture cutout. 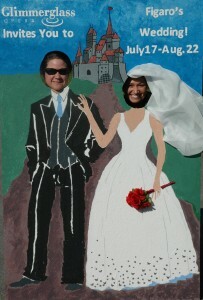 Passersby can have their picture taken as the betrothed Figaro and Susanna. We will also have “Guess the Guest List,” a contest for children to guess how many people will be attending the wedding. Winners receive Glimmerglass Opera paraphernalia. Adults can enter a raffle to win two tickets to the 2010 Festival, and we will, of course, be handing out candy.